Heavy hauling company, Joe Ballor Towing, Inc. provides heavy equipment hauling and machinery hauling services in Franklin, Dickson, and on I-65, I-40, I-840, US-431, US-231, US-41A and throughout Central TN. We offer scheduled and immediate hauling of all heavy cargo including heavy equipment hauling, container hauling and heavy load hauling. Contact our 24hr dispatch center now at 615-591-7445 and speak to a member of the Harpeth Hauling Team about your heavy hauling needs. 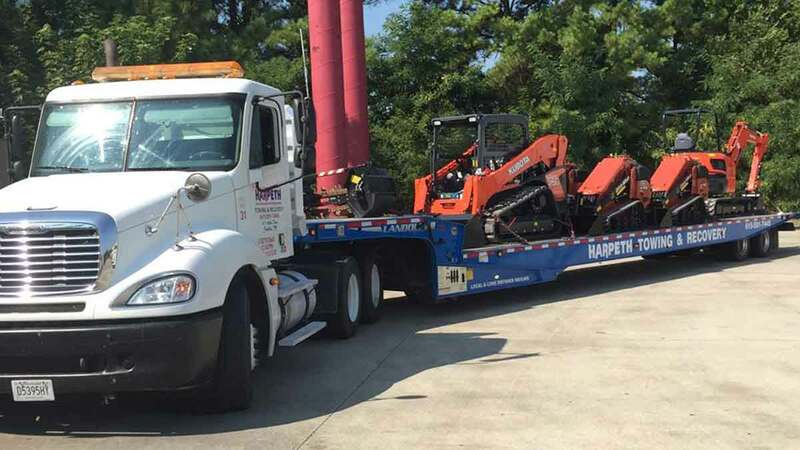 If you're looking to avoid the costs associated with owning and maintaining trucks to haul equipment that may not move frequently, consider partnering with Harpeth Towing & Recovery as your preferred equipment hauling partner. We can work from your schedule or provide immediate hauling as needed. Many companies use oversized hauling vehicles and trailers for moving lighter equipment. And they charge a premium for it. Don't overpay for your hauling by hiring the right truck for the job. 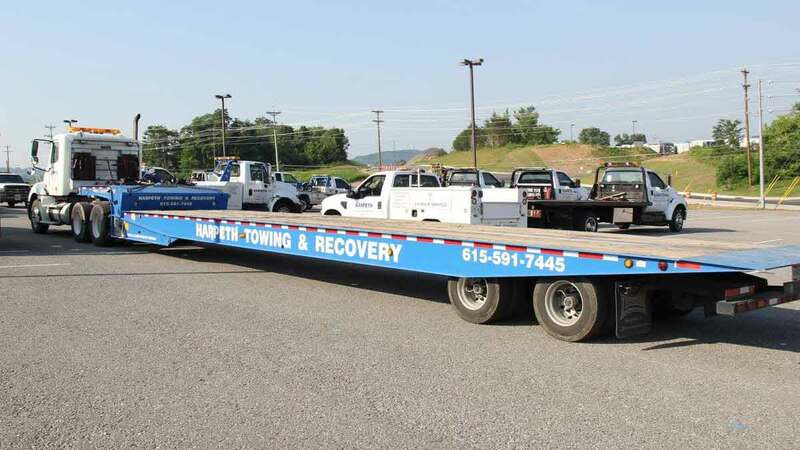 Call Harpeth Towing & Recovery now at 615-591-7445 to learn about our hauling capabilities. 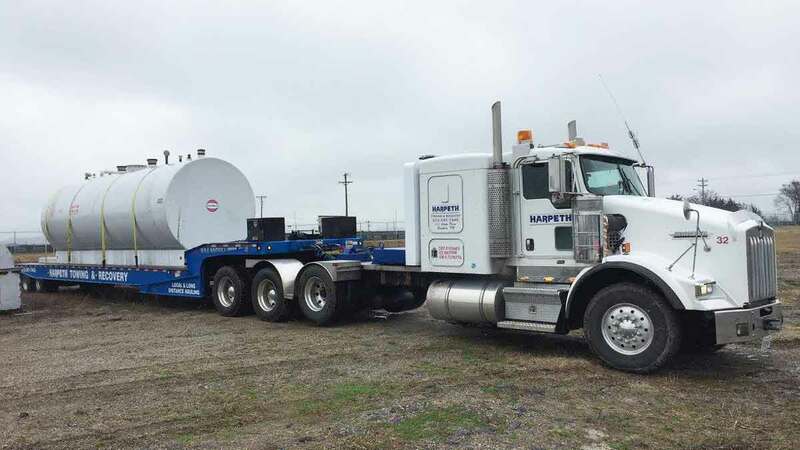 Oversize load trucking company, Harpeth Towing & Recovery provides trusted and permitted oversize load hauling and transport in Central TN and throughout greater area. We frequently provide our clients with expert heavy load trucking on I-40, I-65, I-840 and all other major roadways. Thanks to our 24hr dispatch center, Harpeth Towing & Recovery can provide scheduled or immediate oversize load trucking. We carry a blanket Oversize Load Permit for our entire heavy hauling fleet, ensuring uninterrupted delivery of your oversized load to wherever its headed. Call 615-591-7445 to speak to a member of our Heavy Hauling Team and arrange hauling of your oversize load. Harpeth Towing & Recovery is your source for shipping container loading and hauling services in Franklin TN, Dickson TN, and throughout Central TN. Our fast and affordable services provide a virtual transportation department for many clients saving them time and money. To ensure the highest quality of customer service, we have dispatchers available to assist you 24 hours a day, 7 days a week, 365 day out of the year. With over 200 years of combined experience, our team of operators are trained and highly experienced in loading and hauling all sizes of shipping and freight containers. 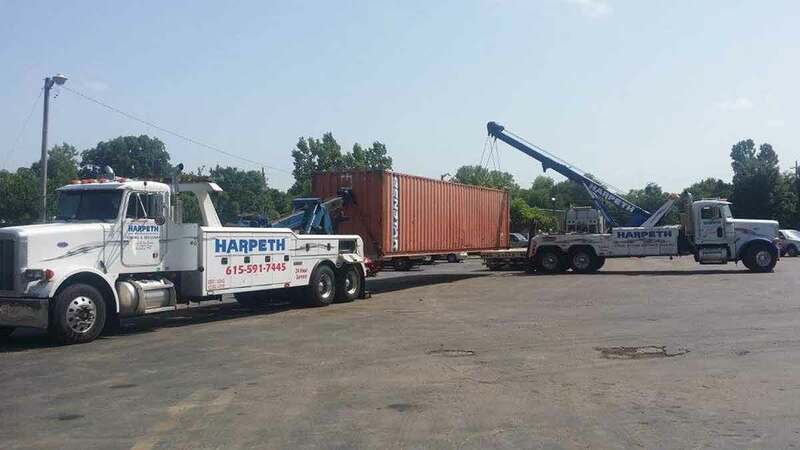 Harpeth Towing & Recovery takes care of the entire process so you can rest assured that your shipping container or heavy load will be safely transported to its final destination. Call our dispatch center now at 615-591-7445 for container loading and container hauling services. Harpeth Towing & Recovery provides heavy construction equipment hauling and tractor hauling services in Franklin TN, Dickson TN, Williamson County and throughout Central TN. We are experienced in loading, securing and hauling all types of construction equipment, tractors, trailer and attachments from multi-unit small tractor hauls to oversized heavy equipment hauling. For all your emergency heavy hauling needs, we will provide you with reliable service you can trust at prices you can afford. Contact our 24hr dispatch center now at 615-591-7445 to get Harpeth Towing & Recovery working hard for you.